This anthology exhibition, curated by Jo Anna Isaak, includes the works of 20 women artists from the United States, England, Ireland, France and Russia who explore what has been described as the “subversive potential of the carnivalized feminine principle” to disrupt art history’s long held ideas about originality, creativity and genius. Laughter Ten Years After revisits Isaak’s influential exhibition The Revolutionary Power of Women’s Laughter, which opened in New York City in January 1986 and traveled in the U.S. and Canada for two years. Included in Laughter Ten Years After is work from the original participants (Mary Kelly, Barbara Kruger, Nancy Spero, Jenny Holzer, and Ilona Granet) along with other artists who have in their own way, come to employ laughter and the carnivalesque as a strategy of disruption, misrule, and liberation. Many of these artists, though well known, have not been shown in Vancouver. Panel Discussion: Includes Jo Anna Isaak, Susan Unterberg, Kathy Grove, Elaine Reichek, and Jeanne Silverthorne. 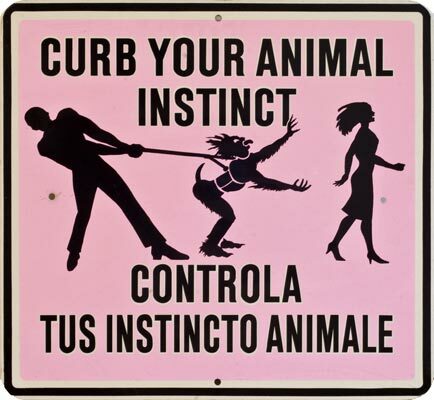 Ilona Granet, Curb Your Animal Instincts, 1986. Enamel on metal, 61.0 x 66.0 cm.